3 Reasons to Not Play Mega Millions! Yes, I am aware that there are 1,000,000,000 reasons to play Mega Millions this weekend (And an additional 470,000,000 reasons to play Powerball). However, I am giving you 3 reasons NOT to play MegaMillions or Powerball this weekend or ever!! The problem with the lottery is that it makes poor people feel poor. Studies have shown those making less than $13,000 in annual income spend anywhere from 5%-9% of their income on lottery tickets. Let that statistic sink in for a minute. Every ticket you purchase drives up the jackpot which further entices those with the least money into playing the lottery. Which is why many people refer to the lottery as a Regressive Tax on the poor. What the government isn’t able to take from the low income earners in taxes, they take in state-sanctioned gambling. Other call it a positive feedback loop, where the poor play the lottery which keeps them poor which keeps them playing the lottery. Meanwhile the state governments* (and federal governments by taxing the winnings) are making literally tens of billions of dollars (states took in $70B in 2014) off of the lowest earning. Plain and simple, the lottery is a state-legalized gambling system that exploits the most vulnerable in our society. • First of all, it’s not $1B you’re winning. You’re winning a $1B annuity paid out over 30 years. • Based on current interest rates, the actual cash out is $565.6M. • For instance, in NJ you pay 10.5% income tax (in addition to all of the money NJ made on ticket purchases) so $59M goes to NJ in taxes. • Then about 35% goes to the federal government in income tax. (After you deduct your state tax payment) Your federal tax payment would be $177M. • Out of the $565.6M, you pay $237M in taxes and your take home is $329M. Your odds of winning that $329M are 1 in 302,575,350. That still seems like the odds are in your favor until you remember 2 things. First, each ticket costs $2 to purchase. And second, there are other people who are also buying tickets (5 of the 7 highest jackpots were split winners). So you might need to share your winnings and “only” take home $164M. I get it. $164M is not a small number, but it certainly is a far cry from $1B that gets published. No matter how you slice it, the expected value for playing the lottery is a negative sum game. And yet, according to one study, 21% of American polled believe the lottery to be the best strategy to accumulating wealth (The number increases to 38% when you lower the income level below $25,000). It is unconscionable to see how glib Americans are about the lottery system, which serves as a Regressive Tax that continues to exploit the lower income. All the while, governments are double dipping in proceeds and taxes. Perhaps most instructive to me as to why I wouldn’t want to win $1B is because I wouldn’t be better off. Oh sure, I’d be better off financially, but there’s no question in my mind that I would be worse in perhaps every other area of my life. The plain truth is that I am not ready to be $329M richer. God doesn’t want you to be happy because you won $1B he wants you to be happy because you’re content with what he’s given to you. So, don’t be beset by greed, don’t feed the system and don’t further exploit the poor. My son once opened his fortune cookie during dinner and I wish it could become the mantra of all thinking of playing the lottery. "To be upset with what you do not have is to waste what you do have." Amen, fortune cookie man, amen. If you're a fan of TED talks, then you've certainly heard Angela Duckworth's talk on Grit. In it, she talks about how the one quality that most directly correlates with success is Grit. That quality that could be described as courage, determination, intestinal fortitude or stick-to-it-iveness. Or as it's known in my house, "Go back and try the problem yourself, before asking me for the answer." Discover your Idea Worth Spreading. I work for International Justice Mission, the largest anti-slavery organziation in the world. And you don't get to be best in class without doing something that works. And so, my idea worth spreading is not really my idea, at all. It's the model of transformation that IJM has been using throughout the world to put an end to slavery. Find the TEDx events in your area. From the TED.com website, you can find out where all the TEDx events are being held around the nation. So, I basically chose every TEDx event in NJ or VA. That produced about 20-25 events. But upon closer inspection, many of them don't apply to me. TEDxWomen or TEDxYouth events were removed and that left me with about 15 events that were good potential possibilities. Fill out a speaker application. I went to the link to fill out the speaker request form on their website (it wasn't easily accessible from the main website, for whatever reason). I'm not sure why they make it so difficult to make contact. Perhaps it's an oversight... or perhaps it's their brilliant scheme: if you're not smart enough to find a way to conatct me, then you're not smart enough to be a TEDx speaker. I would recommend taking your time filling out the application and making sure that your answers to the questions are concise and compelling. Concise because you want to intruige them to pursue a further conversation. Compelling because you want to appeal to their audience. Out of the 2 applications I filled out, I got 1 response. Pitch your talk on the phone. I had a phone call interview with the event organizer to go throught the topic of my talk. Once you have them on the phone, you are essentially picthing yourself as much as your idea. They are going to make sure that you are you a good communicator and have a likeable personality. So, I did my best impression of a likeable person and... booked it. Basically, it went from 1000s of TEDx events, to 25 regional events, to 15 possibilities, to 3 responses, to 2 applications, to 1 phone call. So, you can see how it took a modicum of grit to get it done. So, thank you, Angela Duckworth. There are a few things that would probably make a preacher/speaker bucket list. And doing a TEDx talk would probably be a very common one. 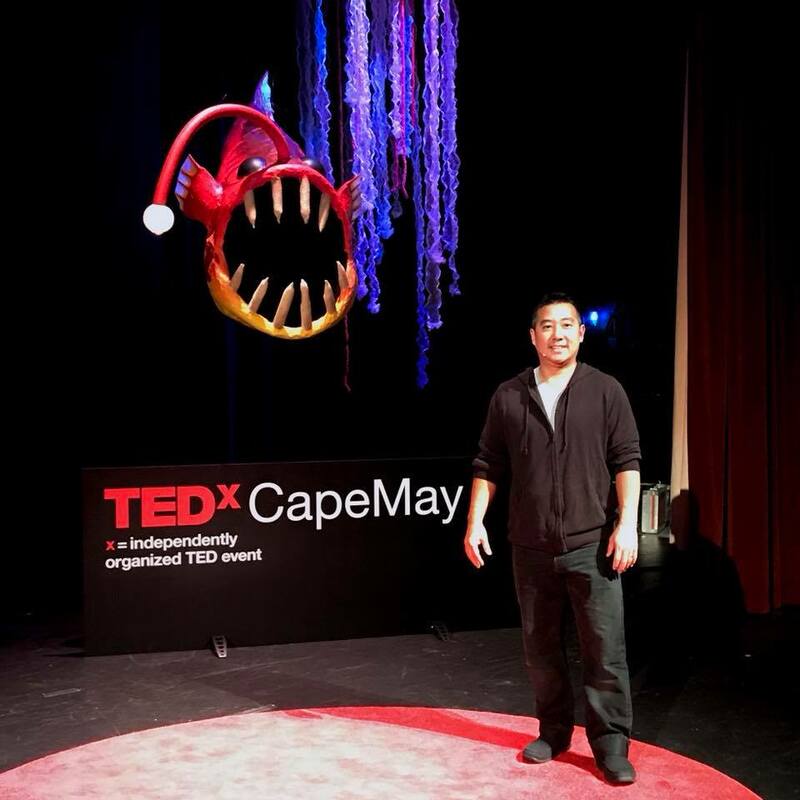 I was honored to be a TEDx speaker at TEDx Cape May this month. How I landed the talk will be another post for another day. But for now, I'd like to chronicle my experience during that weekend. The TEDx Talk was in Cape May, NJ, which is one of the nicest places to be in the great state. It just so happens that it listerally the furthest point in NJ from my house. So it took a full 3 hours of driving on Saturday. On the bright side, I was able to practice my talk without interruption and without being able to cheat by looking at my notes. When I arrived, I pulled up to Congress Hall and immediately got a sense that I was staying somewhere historic. It turns out it is the 1st seaside hotel in America! And it was called the summer White House because it was frequented by US Presidents. I had spoken with a friend who gave a TEDx talk a month prior to mine and he told me that he did a full run-through the day before. So I was prepared to do my full talk. As I pulled up to the Lower Cape Regional High School, I noticed that the sound crew and the lighting crew seemed awfully young. It turns out that they utilize volunteers from the highschool. I thought that was cool... just don't mess up my lighting, kid. It turned out that no one was rehearsing their talk, they were just making sure that their slides were working and that they knew where to stand. I had to make a special request because I start out my talk by getting a $20 bill from the audience. So they had to make sure the camera was tracking me and that the lighting fill would keep me lit. I was a bit bummed that I didn't get to do a full run-through. That means that the next time I delivered my talk in front of someone, it would be the real deal. After the rehearsal, we all headed over to a local woman's house who had catered a special dinner for the speakers. She had seen that a TEDx was coming to her town and wanted to do something special. It was great to meet the other speakers and hear what everyone was talking about. It was a bit intimidating to see such accomplished people in their field. But it was too late for them to disinvite me, so too bad, suckers. I rehearsed once in my room and read over the notes and basically fell asleep watching netflix to take my mind off of the talk. Of course, I woke up at 5:00am for no good reason other than I was probably very nervous... and I had to pee. The next morning I went down for breakfast and had breakfast with the one speaker I was most excited about meeting. Daryl Davis is one of the most accomplished R&B piano players out there. He played with Chuck Berry for over 30 years, but has made his more recent fame through befriending members of the KKK at clan rallys... Daryl Davis is black; that's an important part of the story. I had heard about his story after the Charlottesville riots in August and was thrilled that we were going to be on the same stage. [Aside: There is a great conversation between 2 friends of mine on the New Activist podcast about the Charlottesville riots. Full disclosure, I work for IJM, the sponsor of the podcast. But still, you should listen]. When we arrived at the highschool (Daryl caravaned behind me so he wouldn't get lost... uh, you're welcome). We walked into the auditorium to see the star of the show, Wyclef Jean, up on stage doing a sound check on his guitar. He was the biggest marquee name of the speaker lineup and the other speaker that I was most excited to meet. After getting settled in the green room (read: boys dressing room for the HS musical), we made our way into the audience to hear the various talks. I'll go through each speaker in another post, because I found a lot of their talks really interesting. When it was the speaker before me, I went backstage and got ready in the green room. Getting ready for me meant getting my microphone and getting my blood flowing. Usually what I try to do before I go and speak is jump up and down a bit and flail my arms in circles. I'm trying to get my adrenaline up so I don't come out flat. And then, it was showtime. How I Read 52 Books in 2014! How to get your iPhone to read you a Kindle book in 5 simple steps! What sort of solitary and lonely life is that the only reason someone notices you are not alive anymore is because your roof developed a hole! Think of how many people you come across every single day. Think of all the opportunities for personal contact, where you can make an impression on someone, that you have every time you leave the house. Your co-workers, your neighbors, your family... If you were to die today, how soon would anyone know?